Explainer: Water parks across the U.S.
Splashin’ Safari, Santa Claus, Ind. Gone are the days when people were happy to cool off simply by jumping in a lake or splashing around in the pool. A growing number of ever-more-elaborate water parks around the country have added new rides where water shoots, squirts, swirls and performs fast-moving, adrenaline-inducing stunts. Ready to take the plunge? Here are some new and award-winning water parks and a few offering new features this season. The water slides at the new Wings & Waves Waterpark begin inside a real 747 airplane. 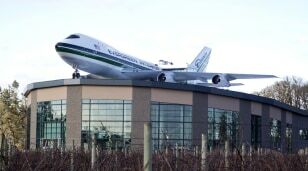 The country’s newest water park opens June 6 in an unlikely spot: the Evergreen Aviation & Space Museum in McMinnville, Ore. Best known for housing Howard Hughes’ Spruce Goose, the largest airplane ever built, the museum’s claim to fame may change once the Wings & Waves Waterpark begins sending visitors down one of four giant slides that start inside a Boeing 747 mounted on the roof of a 60-foot-tall building. An artist's drawing of Mega WaterWorld, still under construction, in Roanoke, Texas. When finished the six-story water play structure will pump 12,000 gallons per minute through it. On the Scorpion's Tail water slide, the rider whooshes through a 45-degree angled loop-de-loop at speeds of up to 40 mph. In the Wisconsin Dells, the self-proclaimed Waterpark Capital of the World, there are 20 indoor and outdoor water parks to choose from. Among them is the 49-slide Noah’s Ark Waterpark, which bills itself as “America’s Largest Waterpark.” In 2010, the park introduced the Scorpion’s Tail, a 10-story-tall slide that was the first looping tube waterslide in the U.S. and the tallest and largest of its kind in the world. The Falls, at Schlitterbahn New Braunfels Waterpark in Texas, claims to be the world's longest waterpark ride. The family-owned Schlitterbahn chain of water parks includes one in Kansas City, Kan., and three in Texas: Galveston Island, South Padre Island and New Braunfels. 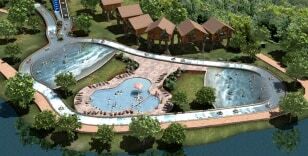 The 65-acre park in New Braunfels boasts the world’s first surfing machine and has won the industry’s coveted Golden Ticket Award for Best Waterpark for more than a dozen years. In the world of water parks, there’s no resting on your laurels, so this year the park is introducing The Falls, a 3,600-foot-long whitewater river attraction said to be the world’s longest water park ride. Once you finish the ride, you don’t have get out because there’s a conveyor belt — the Aqua Veyer — that take you back to the start. In addition, Schlitterbahn’s Kansas City water park, which opened in 2010, is already doubling in size with this year’s addition of the region’s only surf ride, a rapids river, two head-first mat slides, a totally enclosed tube slide, a whitewater tube chute and a ride-up Aqua Veyer. The world's longest water coaster won two coveted Golden Ticket Awards in 2010. Introduced in May 2010, the Wildebeest at Holiday World’s Splashin’ Safari in Santa Claus, Ind., lays claim to the title of world’s longest water coaster. In 2010, the 64-foot tall, one-third-mile long ride won the Golden Ticket Award for Best New Waterpark Ride and the award for Overall Best Waterpark Ride. After a conveyor ride up a hill, each four-person boat makes a four-story drop and then travels up seven more hills, through underground tunnels and around a helix. 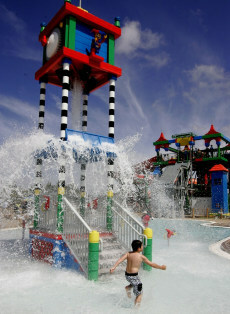 LEGOLAND Water Park won an industry innovation award in 2010. Along with Les Trois Forest in Europe and China’s Beijing Water Cube, which previously served as the National Aquatic Center during the Beijing Olympics, LEGOLAND Water Park in Carlsbad, Calif., earned the World Waterpark Association (WWA) 2010 Industry Innovation Award. The 5.5-acre, $12 million LEGO-themed park includes an 850-foot-long lazy river, tube slides as long as 240 feet and the Water Fall, which frequently dumps 500 gallons of water from a 45-foot-tall tower. 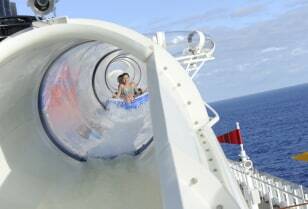 The Disney Dream's AquaDuck sends riders out over the water in a see-through tube. There’s no reason water parks must be on land. The Disney Dream cruise ship set sail in 2011 with both a water park area and a water coaster on board. The first shipboard water coaster, the AquaDuck, is a 765-foot, four-deck flume ride that extends over the side of the ship. Have we missed your favorite water park? There’s a very good chance we did. More than 1,000 water parks have opened in the United States since 2004. Now, water parks and water-themed attractions can be found in hotels, resorts, amusement and theme parks, some zoos and an increasing number of town and city parks. Everyone has their favorite spot, so please share your recommendations in the comments section below.